The blower door is an essential tool for building energy-efficient homes and finding leaks in existing homes. 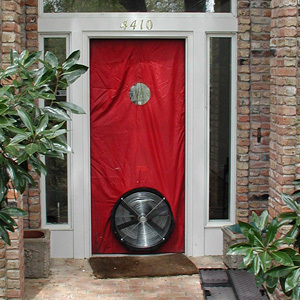 A blower door is a tool that depressurizes a home. The depressurization exaggerates the home’s air leaks and makes them easier to measure and locate. Every house leaks, and that’s why we perform blower door tests—to measure the home’s leakage rate. Who needs a blower door test? 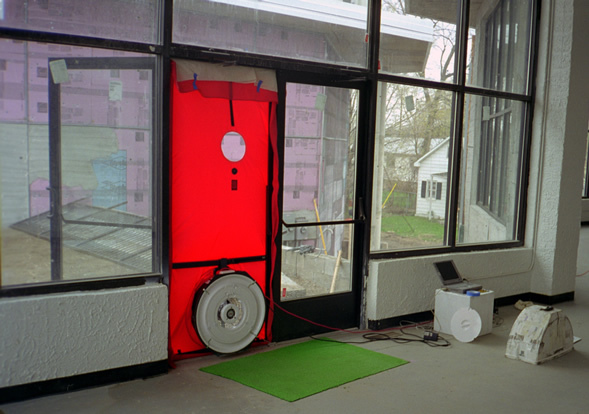 A blower door test is useful for new construction and for existing homes. If you are building a new home, the best time is after it is insulated but before the drywall is hung. If the test reveals major problems, the leaks can be more easily fixed at that point than later on. A blower door test is sometimes required for new construction as part of local building code. It is also required for certain home labeling programs, but anyone building a new home can benefit from the test by locating and eliminating air leaks to improve occupant comfort and reduce energy consumption. For existing homes, a blower door test can be required for certain community rehabilitation programs, but an existing home is generally tested simply to find out just how leaky it is, and to help locate and stop the leaks. A weatherization contractor who uses a blower door while fixing leaks at your home is performing “blower-door directed air sealing”. By testing air leakage rates both before and after conducting air sealing, the effectiveness of the work can be established. Who can do a blower door test? A blower door test should be performed by a qualified individual who has been trained to operate it and interpret the results. For code compliance, the qualifications will vary by jurisdiction. The staff at Green River are experienced RESNET Certified HERS Raters. We are trained and certified to perform blower door tests and interpret the results, helping builders to tighten up the building shell during the construction process, attain code compliance, and satisfy home energy labeling program test protocols for air tightness. How can builders benefit from blower door testing? Do a better job the next time they build a similar home. Blower door testing and thermal imaging camera can be used to evaluate a commercial building’s Envelope Leakage Rate and locate the sources of the air leaks. Using these methods, the blower door test is performed in single-point depressurization mode. The building is depressurized to -50 Pascals (USACE method requires -75 Pascals). The average leakage rate is then observed as CFM50 using a calibrated digital manometer. When Are These Tests Required? The 2012 International Energy Conservation Code (IECC) requires testing of multifamily buildings less than three stories. The General Services Administration (GSA) requires testing of all new government buildings. The United States Army Corps of Engineers (USACE) has an air-tightness requirement and all new buildings and major renovations must be tested for air leakage. Give us a call at (865) 919-7464 or contact us online to schedule a blower door test today!